DRILLING STRUCTURES AND COVERS THE FULL RANGE OF RIG COMPONENTS. 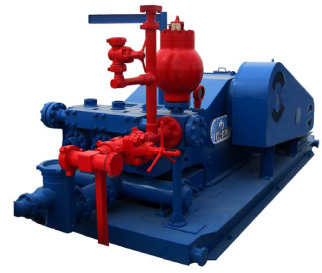 Loadmaster Universal Rigs, Inc. offers high quality mud pumps from 500 HP to 2200 HP, based on the time proven industry standard F-Series Mud Pump and are operationally and spare parts compatible. Key improvements and upgrades distinguish the Loadmaster Premium Series of mud pumps. Manufacturing under a strict API Q1 QA/QC program, all pump assemblies meet standard installation tolerances. Each mud pump is fully tested in our factory before delivery. The test data is recorded digitally as a part of the QC program. Third party certification can be provided upon request. All Loadmaster pumps can be unitized with either AC or DC motors, or mechanical drives. Pumps can be mounted on standard oilfield tailboard skids, or trailerized for easy transportation. Pulsation dampeners are made of forged steel rather than cast steel, improving reliability. All high pressure parts are hydrostatically tested. Internal components are changeable with off the shelf consumables. Loadmaster Universal Rigs, Inc. and Loadmaster Engineering, Inc. are separate corporations which manage and control their own affairs. Each of these companies has its own separate identity, but in advertising and in our brochures we may sometimes use the word "Loadmaster". The use of such term is for convenience only and is not intended as an accurate description of corporate relationships.